Do you have a design style that defines you? While I am influenced by many styles, the one that most resonates with me is French Country, so for pretty much every holiday on the calendar, you will see my French influenced version of it. 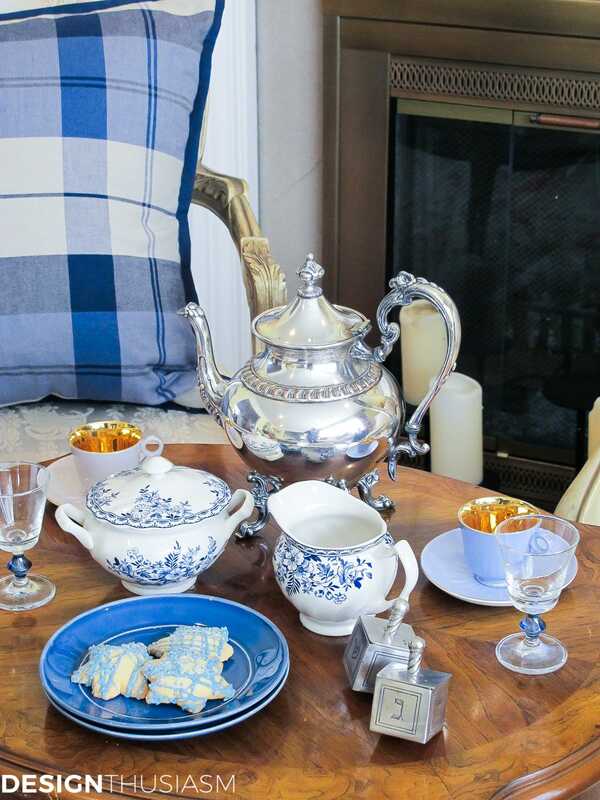 Today I’m setting a Country French Hanukkah Tea by the hearth. 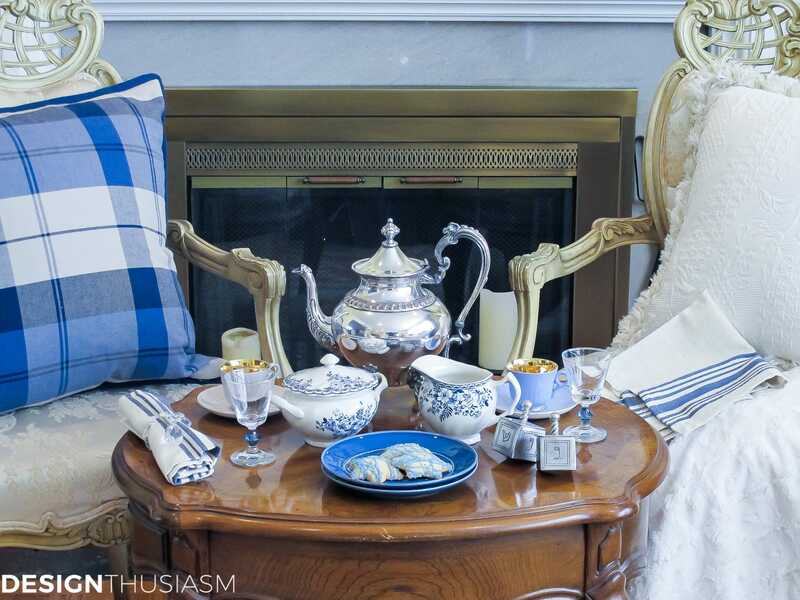 The foundation of this look is an antique tea table set up by the fireplace, flanked by vintage French chairs. 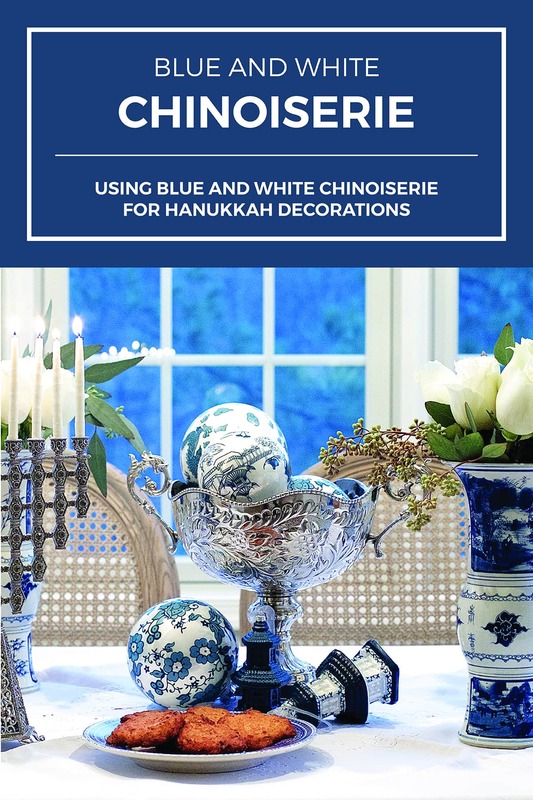 The ubiquitous blue and white associated with Hanukkah fits so comfortably with this look. 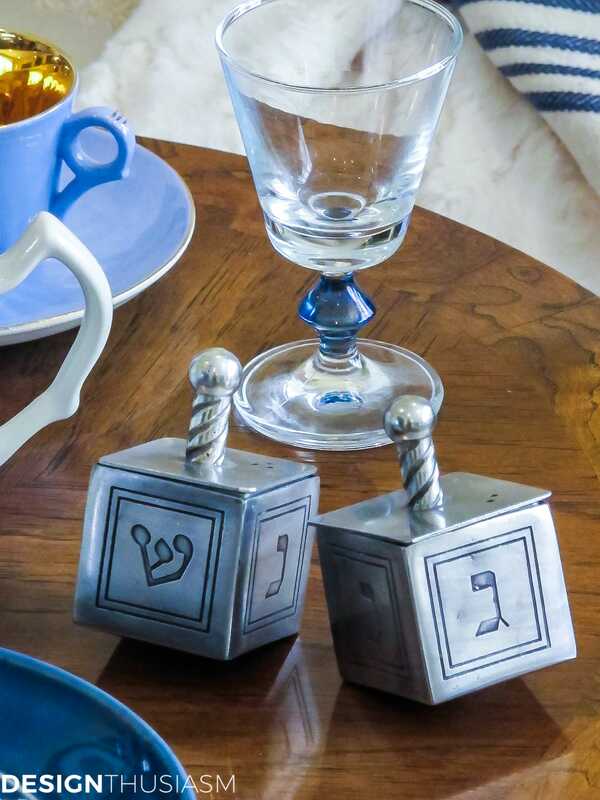 The dreidel salt and pepper shakers are among my favorites and they drive home the Hanukkah theme. 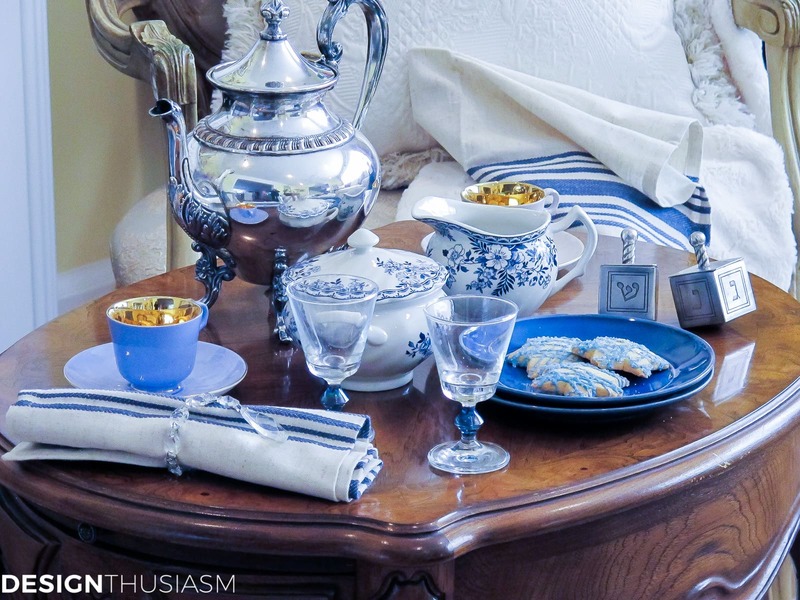 Little cordial glasses with blue pops of color are a charming decorative accessory. 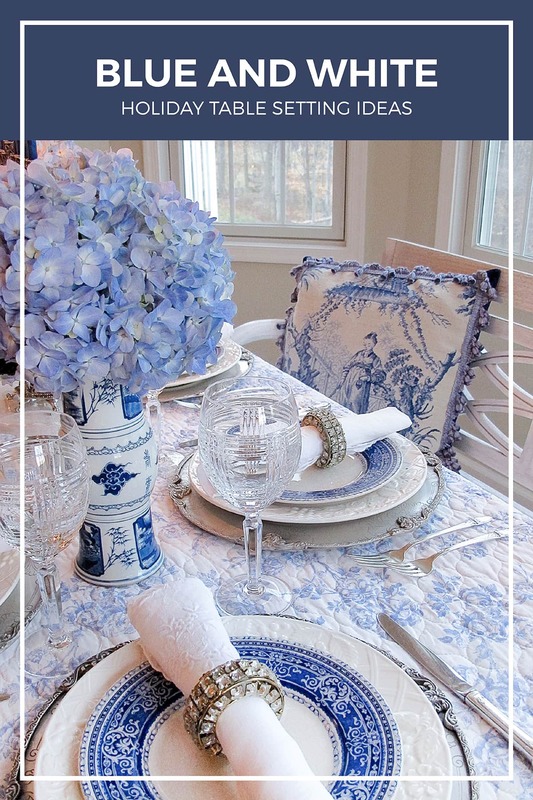 What could be more French than French blue plates? 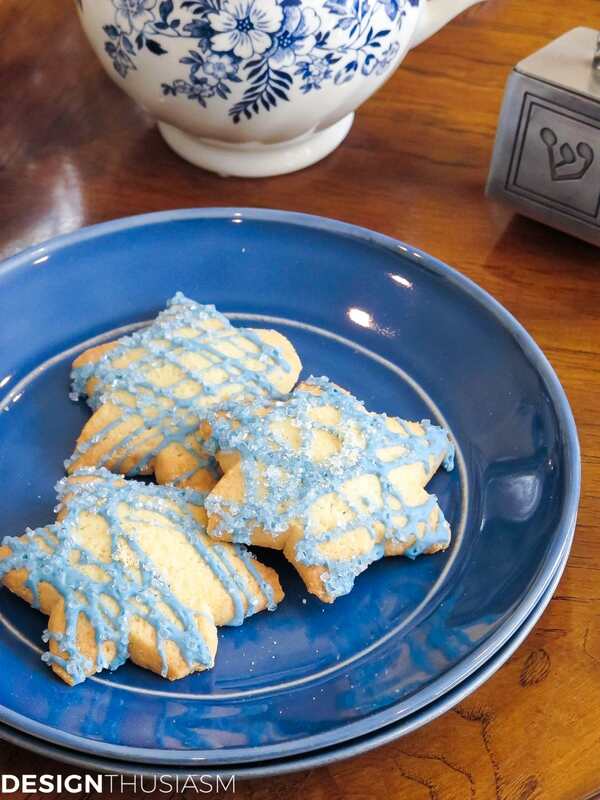 The distressing on the edges honors the casual nature of this style, as they’re serving up lovely Hanukkah sugar cookies. 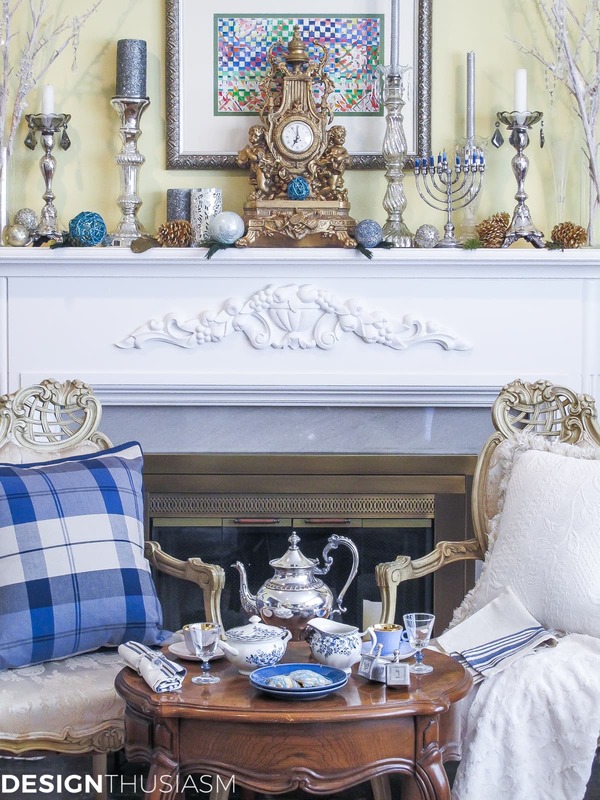 I did a simple update of my holiday mantel, switching out the red and gold glittered orbs and replacing with blues to complement the tea table. 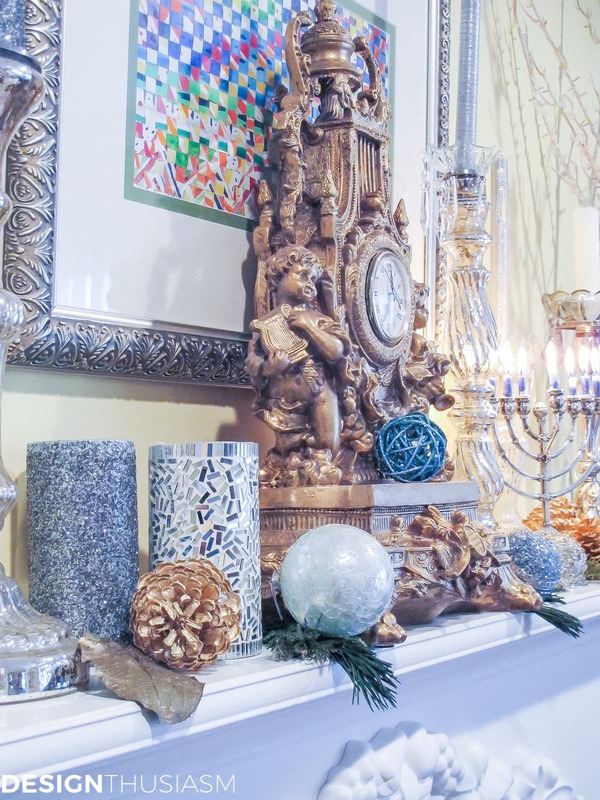 You can see the original mantel in the post How to Decorate a Holiday Mantel. I rarely use items that are an exact match, instead preferring the blend of similar tones. Here the blues peacefully coexist, while representing several shades for added interest. 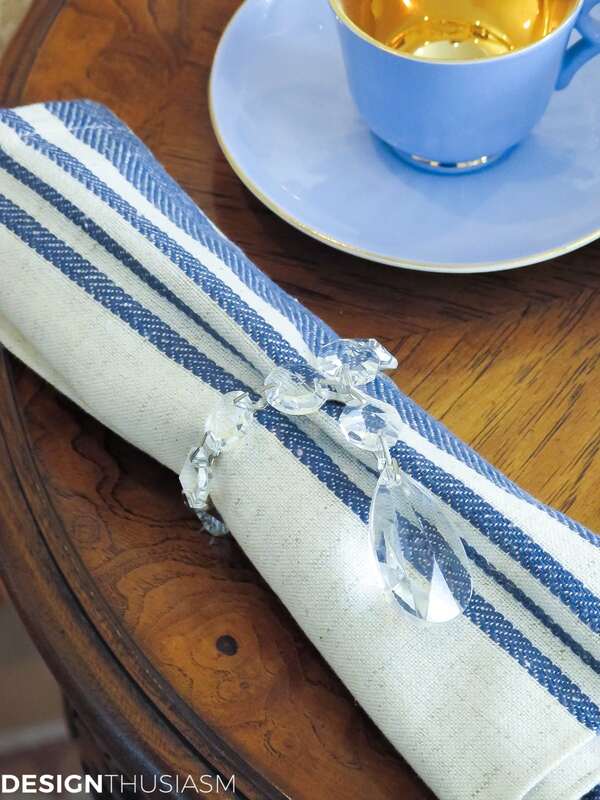 This simple image is very typical of my style, mixing rustic country ticking napkins with an elegant crystal drop napkin ring. 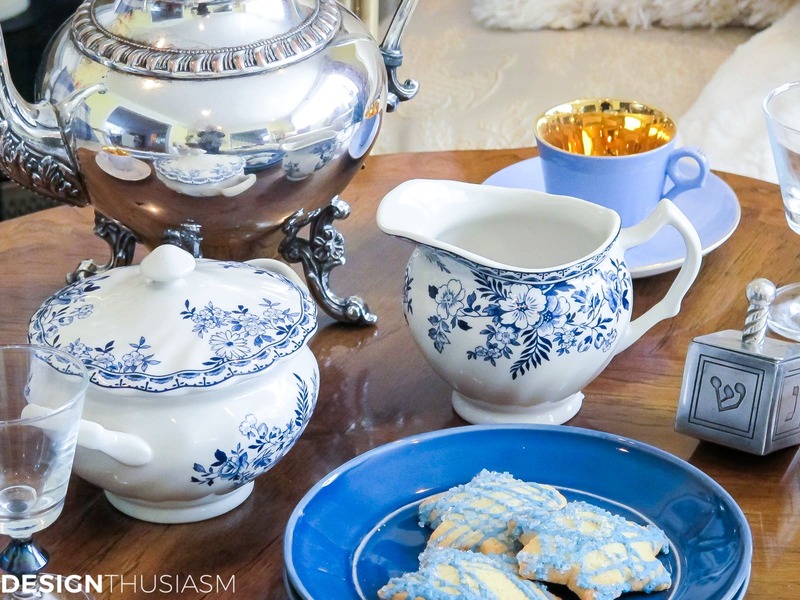 The little blue teacup you can see peeking out from behind the creamer is a favorite of mine. It’s part of a set of six vintage cups in varying colors but all with the burnished gold interior. They are so lovely on a low table, where you can look down into the cups. 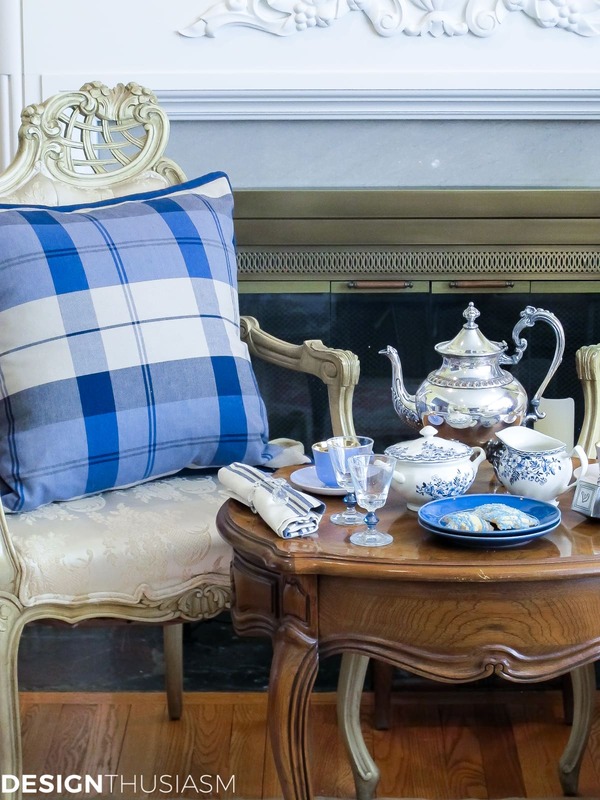 I love to include fabrics in my vignettes, in this case in the form of a blue plaid pillow. Also added to the mantel is my silver menorah, purchased in Jerusalem. 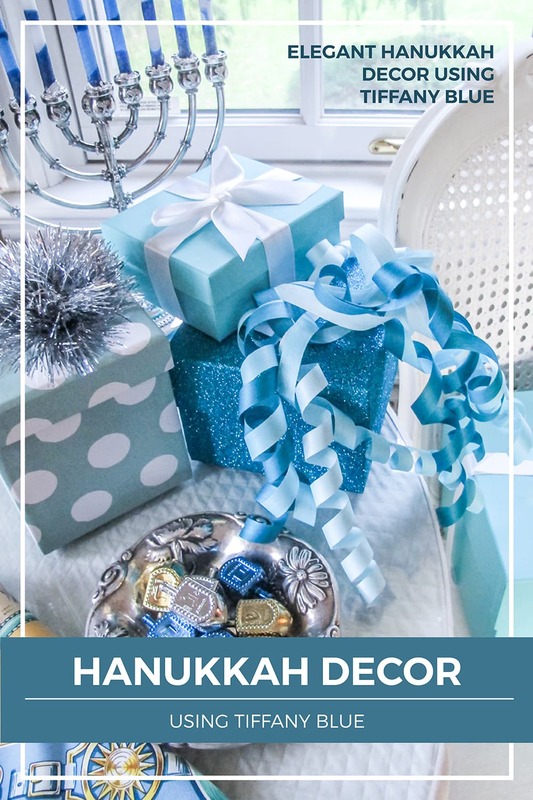 You can get a closer look at it in my Tiffany Blue Hanukkah post. 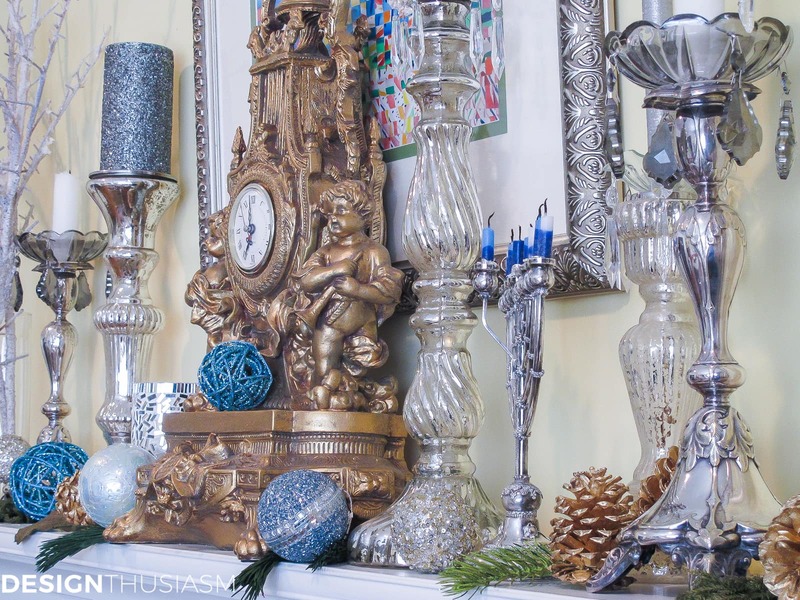 This is so elegant and your mantle is gorgeous. I’ve tried many different styles but feel most comfortable with modern contemporary. Enjoy the season! It’s all so gorgeous! I love the subtle blues everywhere. And I’m a big fan of French country, too. That blue cup with the gold interior is to die for! Your style is really beautiful. Those tea cups are exquisite! Thanks so much, Jeannie! Thanks for stopping by! Enchanting! And the shot of your table — the way it shows the grain of the wood — is exquisite. Thank you! Funny thing is, I realized after the shoot that I had the table backwards. There’s actually some nice carving on the other side that would have looked nice in the photos… lol! Thanks for visiting! It is so pretty…I love all the shades of blue! Your Chanukah tea looks lovely. I love the French country feel. It works perfectly with the blues and silvers. So lovely, I’m ready to sit down and have tea. This inspires me to start using my teapots more, instead of just making one cup at a time. Truly beautiful images. I love your tea time setting. 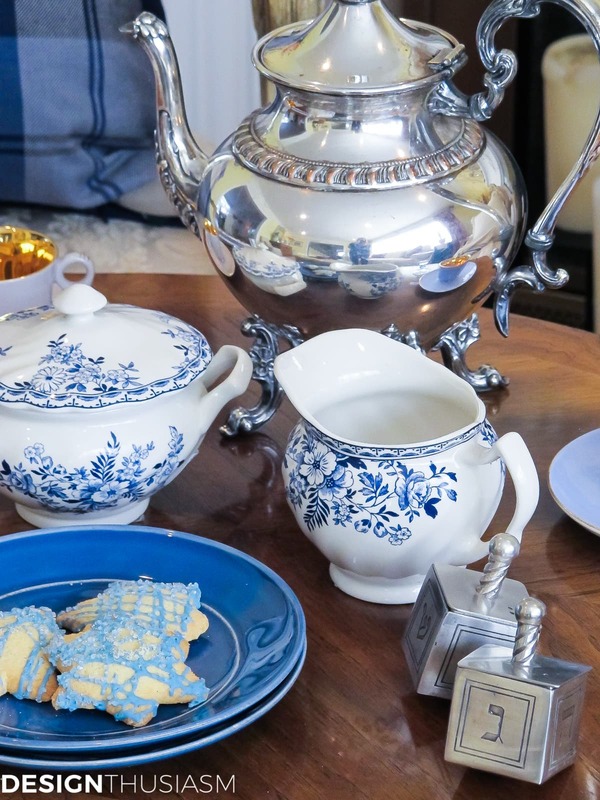 The silver coffee pot is gorgeous. Thanks Janet! I really love everything about the whole tea service thing. Such pretty objects that go along with it… 🙂 Thanks for visiting! It is all lovely. I love anything French. Lovely tea! Just saw this feature on The Scoop. Love it! I guess you could say my favorite is traditional; and mostly European. Thank you for sharing! Thanks so much and thanks for stopping by! Yes, I too love traditional European decor… 🙂 Enjoy the holidays!! saw this featured on the scoop, and had to come see more. i’m always looking for more chanukah inspiration. yours is lovely, and those cookies look so pretty. but not too pretty to eat. enjoy! What a beautiful look. So elegant and pleasing to the eye. A gorgeous celebration. Love the blue. Such a stunning look for the holidays. Great looking cookies too. So pretty, Lory. I love your silver tea set!!!!! My son and DIL are coming for Xmas and I still haven’t finished decorating the house (just couldn’t seem to get going, what with all the holiday attractions going on around here). Hugs!